Our Seattle Mariners are still in the race for the playoffs this season with just a few more home games this month. There’s still time to take in a game or two. 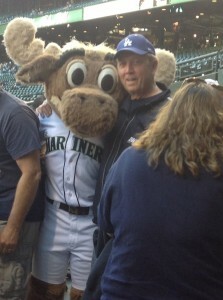 Here is a photo of our guest Doug who met up with the Mariner Moose while taking in a tour of Safeco Field.